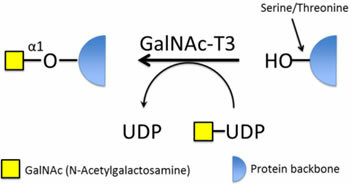 Polypeptide N-acetylgalactosaminyltransferase 3 (GalNAc-T3) catalyzes the transfer of N-acetylgalactosamine (GalNAc) from UDP-GalNAc to the hydroxyl group of serine and threonine residues (1). Twenty GalNAc-T genes have been identified in humans and most have been shown to represent active GalNAc-Ts. All isoforms are type II transmembrane proteins, with different but partly overlapping substrate preferences (2). The GalNAc-Ts control the initiation of mucin-type O-linked glycosylation and determine the location and density of O-glycans in a protein (2). Addition of GalNAc to an unglycosylated Ser/Thr residue creates the Tn antigen GalNAcα1-S/T, and subsequent addition of sialic acid by ST6GalNAc-I forms the cancer associated STn antigen (3). GalNAc-T3 is highly expressed in pancreas and testis, and weakly expressed in a few other organs such as placenta (1). The expression levels of GalNAc-T3 were found to be upregulated in highly differentiated types of adenocarcinoma cell lines as opposed to less differentiated types (4). Overexpression of GalNAc-T3 has also been found to promote pancreatic cancer cell growth (5). Mutations in GalNAc-T3 were found to be involved in familial tumoral calcinosis, which may be mediated through glycosylation of fibroblast growth factor 23, protecting it from proteolytic cleavage (6,7). GalNAc-T3 has a preference for mono- or diglycosylated substrates (8). Bennet, E.P. et al. (1996) J. Biol. Chem. 271, 17006. Tian, E. & Ten Hagen, K.G. (2009) Glycocon. J. 26, 325. Sutherlin, M.E. et al. (1997) Cancer Res. 57, 4744. Taniuchi, K. et al. (2011) Oncogene 30, 4843. Topaz, O. et al. (2004) Nat. Gen. 36, 579. Kato, K. et al. (2006) J. Biol. Chem. 281, 18370. Pratt, M.R. et al. (2004) Chem. & Biol. 11, 1009. Formulation: Sterile filtered solution in 25mM Tris pH7.5 and 150mM NaCl, at a stock concentration of 466 ug/mL. Purity: Greater than 95% by SDS-PAGE. Enzymatic Activity: Measured by transfer of N-acetylgalatosamine (GalNac) from UDP-Gal to the peptide EA2 (AnaSpec Inc, Catalog # 63841), as measured with a phosphatase-coupled assay (R&D Systems EA001). Coupling assay reactions contained: 50mM Tris pH 7.5, 2mM MnCl2, 0.5mM UDP-GalNAc, 0.25mM EA2, 4ug/mL ENTPD3/CD39L3, and 6ug/mL GalNAc-T3 (serially diluted 1:2 for 3pts). Incubated at 37ºC for 30min. >500pmol/min/ug.